Add 1 Tablespoon oil in a heated pan, fry tofu slices until golden brown, remove and set aside. Add 1 Tablespoon oil in the pan, heat with medium to high heat, add onion slices and fry with high heat until fragrant. Add tofu, carrot, bean sprouts and green onions. Keep stirring. Add cooked rice noodles and turn heat off. Add all the seasonings and mix well. 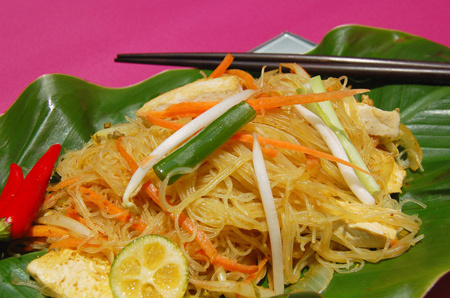 Again, turn on the heat, stir quickly with medium heat until the rice noodles become dry and fragrant. Sprinkle a little green onion pieces for decoration before removing from the heat.